My pocket press is great for smaller printmaking at home at the kitchen table, but it can also print large. I usually recommend using plates that fit my Magic Platen or rubber platen because a good print is dependent on the printmaker (you) pressing steadily and evenly. This recommendation didn’t phase artist Chelsie Dysart, who jumped right into printing big with her Pocket Press, starting with a 12″ x 16.5″ print that you can see on her art page. Most of us need a little more practice to press big because you need to be very mindful about maintaining pressure and staying even when you roll over your plate in your straight overlapping rows. I usually use my Magic Platen to create large prints. The rubbery coating causes the plate to resist movement when pressure is applied, and it is quite strong. So strong, that you can extend your platen’s surface simply by laying a board or book that is the same thickness next to it. If you will be extending your magic platen on either side, and not at the bottom as pictured, you can clamp your felt and paper to your extending boards using large binder clips, clamps, or C clamps. 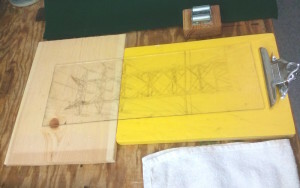 The binder clipped portion will need to hang off the table edge so that it does not cause your extension board to wobble. Most kinds of clamps should be able to open large enough to secure the felt, paper, and extending boards to the table itself. You will need 2 felt blankets large enough to cover your plate. Felt is the only material that will work, and skipping it will create banding. The variety of felt they sell at your local craft or sewing shop should work. Here is a video of me pressing this plate in my home studio. I soak the paper first, and dry it by folding it into a towel and rolling over the back of the towel with a rolling pin. For this print, I used my bulk bottle of Blick block printing ink. If your plate is HUGE, or your don’t have a Magic Platen, there is another, inexpensive setup for printmaking at home with a Pocket Press: shelf liner. You need the thicker, rubbery kind with the holes in it and no sticky side. This stuff is available at most hardware stores and dollar stores. You might need to place two sheets side by side if your plate is very large. You will also need 2 sheets of felt to fit the size of your plate, as well as large binder clips or clamps to clip the shelf liner, paper, and felt sheets to the table. This method will leave the impression of the shelf liner all around your plate. If you’re not a fan of “evidence of process” like I am, one solution is to cut a matboard to go all around your plate. You can also contact me about creating a custom rubber platen or Magic Platen to fit your needs. 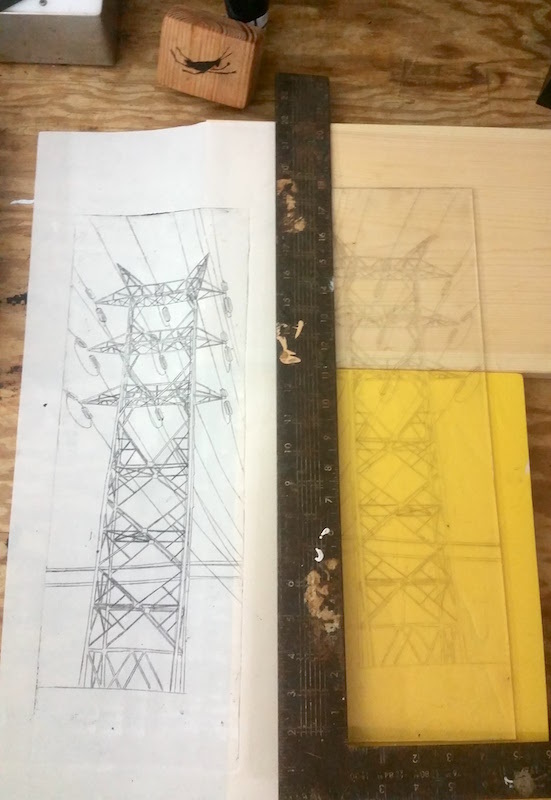 I use an etching plate in this example, but the printmaking setups described in this post will work for pressing all kinds of prints. You can press linocuts and monprints this way. 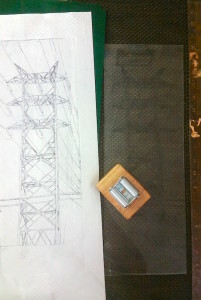 For linocuts, you will need to use damp paper and be aware of banding. You may need to press your plate a couple of times, or really overlap your rows to avoid the appearance of tracks in your large prints. For large scale monoprints, remember that it is possible to press too hard. You’ll have to be very aware of holding even and consistent printing. But don’t let this discourage you. Here’s the video that shows me pressing my large plate using the non slip liner I purchased at my local hardward store.